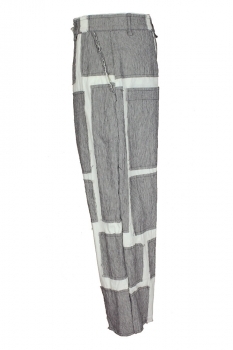 Rundholz Mainline Collection low drop-crotch, ankle length, patchwork style trousers, off-white base fabric with narrow pin-stripe patches, colour off-white. Belt loops. Long buttoned fly, with 6 button fastening and all but the waist button covered by a placket. Layered raw edges at waistband. 2 angled side pockets with raw edging. Raw edging on all patches. 2 large patch pockets at the rear. Raw edged hems. 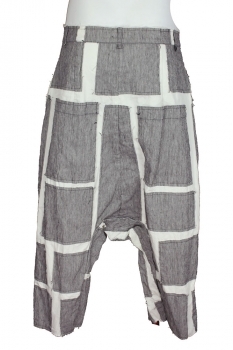 Wonderful trousers for summer.